This maternity shirt can be purchased at Lark News. Dose anyone else enjoy the irony as much as me? Wow---that's a new one! It took me a minute to "get it," lol. My goodness! Thats...um...interesting! I wonder how many they've sold? Ether that pastor has some explaining to do to his church or shes sure there's gotta be a pastor out there looking for a ready made family! They just overflow with christian love! Aw, come on. 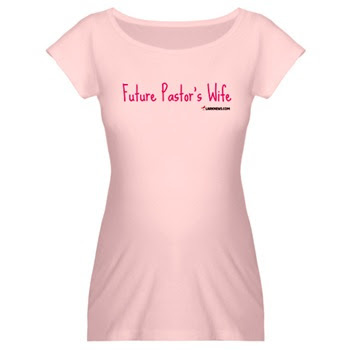 It's for the wife of a future pastor. You people are sick. A. Maze. Ing. So love the Lark. That's because Larknews is awesome. sweet - at first i was sure it had to be about bible college girls pursuing their MRS degrees. I *think* it means the baby is a girl and the parents believe the best case sinario is their daughter marry a pastor. Whatever it means, it is sucktacular. Speaking of, anyone else annoyed with how many people complained and/or asked for more SCL t-shirt options? Not that I love or hate the shirt; I just felt a little bad for Jon. the thing that i love the most is that this makes me feel better about the countless hours i spend looking at stuff i'll never buy on the internet. i feel the bond that we share of wasting time, stacy from louisville. The scary thing is how many people think that way... I do love some of those guys other shirts. By the way... I did a shoutout to your blog with a link on my latest blog post. I have a bunch of friend who I think would enjoy it. Is it okay that I put up a link to your blog on the sidebar of my blog? I hope so since I already did it, but if not, just let me know and I'll take it off. You can't make that stuff up! My wife knew a pastor who just didn't fit the role as well as his wife did. She referred to him as "a sports journalist who married a pastor's wife."